Animals and plants which reproduce asexually can cause terrible problems for the biological sampler! Is a single sprig of moss an individual, or is the whole patch one individual? 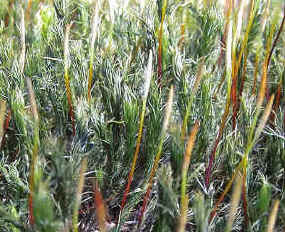 Grasses which reproduce by sending out runners and stolons can cover large areas with what looks like many different individuals of the same species, although in fact they are all the same plant. New plants will often arise where the runners or stolons touch the ground and root. If the runners become detached or die off, the individual 'clone' plants remain as what appears to be different individuals, although they are of the same genetic make-up. The collection of 'clones' of identical genetic make-up is called a 'genet'. The apparent 'individuals' of the genet are called 'ramets'. The genets of some plant species may be hundreds, even thousands of years old! If you are faced with the problem of trying to determine numbers of individuals of different grass species in a grassland, the best bet is to try and follow runners or stolons so that you can identify all the seemingly separate plants which belong to the same individual. As they are all interconnected, they should be treated as one individual. Where connecting runners and stolons have been lost, then there is no way of knowing whether the plants are different genetic individuals or ramets. They therefore have to be treated as separate plants. In any case, as the interconnections have been lost, they are to all intents and purposes different individuals, even if their genetic make-up happens to be the same as the plant next door. 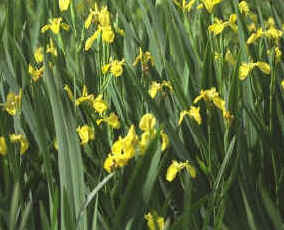 Many wetland plants also spread by vegetative means. Pond Iris is a good example. A single plant may eventually cover a region up to 20m in radius. 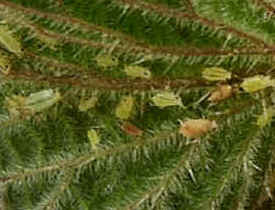 Aphids present a particularly interesting conundrum. During the summer months, females reproduce parthenogenetically, without the benefit of males. Large numbers of individuals are produced which are therefore of exactly the same genetic makeup. In this case the genet may consist of widely separated individual ramets.